So you want to make a worm wheel and gear set on your mini-lathe. Commercially available worm wheel and gear sets for driving telescopes are often very expensive. This is because they need to be made extremely precisely and accurately - there is little room for error. On a 7x12 mini-lathe, the maximum diameter of any object that we can turn on the mini-lathe is 7 inches (180mm). A worm wheel of this size actually needs to be slightly smaller than 7 inches diameter. Couple this with the fact the average mini-lathe allows slightly more than 7 inches, the biggest worm wheel we can make is a 170mm diameter worm wheel with 360 teeth. Each tooth has a pitch of 1.5mm. These theory of making worm gears is quite complex. On a mini-lathe the two easiest gears to make are both 360 tooth, either a 143mm diameter wheel with a 1.25mm pitch tooth, or a 170mm diameter wheel with a 1.5mm pitch. I choose 360 teeth because this is the easiest to index on a homemade indexer. For the best astronomical performance, the worm gear and wheel need to be very well matched, with the minimum of roughness and inaccuracy. This can be achieved by carefully lapping the finished worm wheel and gear together - however, we have a long way to go before we get to that stage! 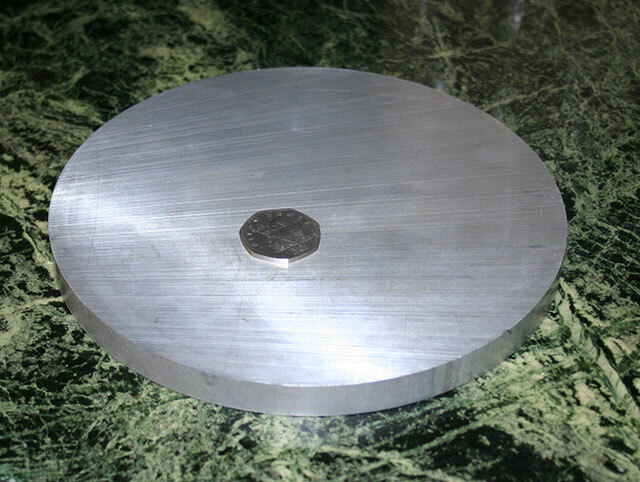 A Worm wheel starts as a blank round piece of aluminium about 1/2 inch thick. It needs to be slightly larger than the target size. 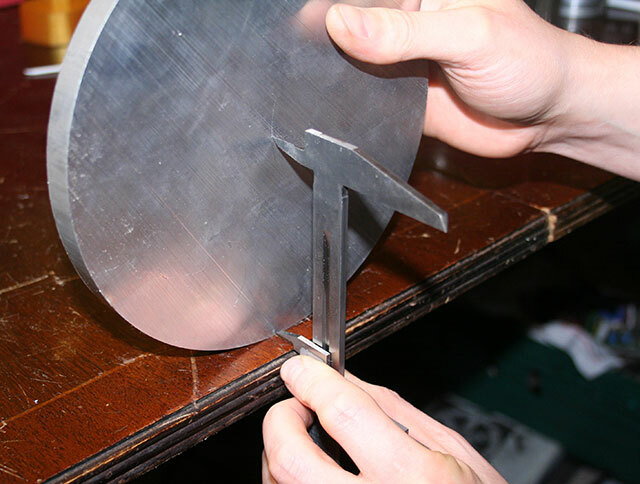 You can either cut the circle out of a bit of aluminium plate, or buy a slice of 7 inch round bar the correct thickness. I strongly recommend the later - especially on a 7 inch worm wheel, because there isn't much room for turning an irregular shape on a 7x12 lathe down to 7 inch diameter. With a small 6 inch wheel this is possible - but buying a 1/2 slice of round bar saves a lot of hassle! Here you can see my starting worm wheel blank from the metal shop. A decent metal shop will be happy to cut one off parts for you like this, if they won't, shop elsewhere. Do not forget that my target is a worm wheel with 360 teeth of 1.5mm pitch. This gives a circumference of 540mm. Dividing by pi, we get a nominal target diameter of 171.88mm. However, this is not the final diameter - more on this later. We are going to need to reduce the diameter by about 6mm, but before we can do this, the blank has to be mounted onto the lathe for turning. To do this, we have to bolt it directly to the faceplate of the lathe. To do this, we have to drill some bolt holes. The first step is marking the centre of the circle worm wheel blank. First I measured its diameter at various positions using my calipers, and got an average reading of about 178mm. Therefore the radius is 89mm. To mark the centre I lock my calipers at 89mm, and hold them up right on the edge of a flat surface. I don't have a surface plate, so I use my patent pending flat table. So long as we are within a couple of mm of the true centre, we will be ok. With the bottom of the internal caliper flat against the table, we roll the wheel passed the upper caliper, letting it scratch the surface of the metal. Repeat 90 degrees further around the wheel, and again 45 degrees off. Where the three marks cross, is the middle. Make a light tap with a prick punch on the crossing point. Use the calipers to make sure the punch mark is in the centre using the calipers. If it isn't try again on the other side. Some blue marker pen helps you see the scratches. Do not hit the prick punch too hard, you just need enough of a dent to put your dividers in shortly - a whack from a centre punch is too much. Now go and find your dividers and make a cup of tea.